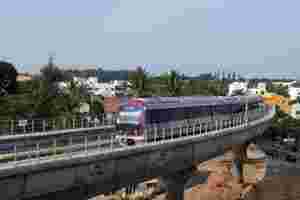 Bangalore: The first phase of the Bangalore metro was inaugurated on Thursday, in what could be a major step forward to easing the city’s traffic woes. The 7.5km long eastern line, now open to the public, connects the city’s central business district MG Road to Byappanahalli. Union minister for urban development Kamal Nath flagged off the Namma Metro (“Our Metro" in Kannada) service at 11am and took the first ride along with Karnataka chief minister D.V. Sadananda Gowda in the trademark purple and white coaches. The project has been financed by the central and state governments with a long-term loan from the Japan International Cooperation Agency. “This is one of the best examples of co-operative federalism in action. The best technological minds from across the country, and world, have come together," said Arun Jaitley, leader of the opposition in the Rajya Sabha. “Despite the different political complexions of the central and state governments, we have made a great stride in solving a vexing problem." Ranjan S., who owns a retail garment store on MG Road, said that he would use the metro for the daily commute between his house and shop. “I can abandon my vehicle once they extend the service to other parts of the city, particularly the city market area, where I do a lot of purchases," he said. The metro is the only solution to resolve the traffic problems of an expanding city like Bangalore, said T.V. Mohandas Pai, former human resources director at Infosys Ltd, who took the inaugural train. “Eventually the metro service should be at least 250km long. The Union government must allot at least ₹ 25,000 crore for such an expansion," he said. The Byappanahalli-MG Road link has a total of six stops and travel time is around 14 minutes. According to the Bangalore Metro Rail Corporation (BMRC), each train will have three coaches with a capacity of around 1,000 passengers. The service will run between 6am and 10pm. The minimum fare will be ₹ 10, while the maximum is ₹ 15. Each station will be serviced by a feeder bus service for an area of around 3km radius around the station. The buses have also been painted in the purple and white colour scheme of the metro service for easy identification by passengers. The approval for phase II will be given once the state government presents the detailed project report to the centre, said Kamal Nath. The second phase will extend the first phase by 72km and will connect IT hubs Electronic City and Whitefield. “For the second phase, we are looking at around ₹ 25,000 crore to fund the project," he said. Nath also announced that the project to provide connectivity to the city’s airport from MG Road will be now handed over to BMRC. The project will be taken away from the Bangalore Airport Rail Link Ltd that was set up by the state government to create a High Speed Rail Link (HSRL) monorail project between the two centres. It is unclear whether BMRC will build an HSRL link or go for a traditional metro service. Under an HSRL the top train speed will be 145km per hour and the 35km distance will be covered in half an hour. The metro, on the other hand, will run at around 65km per hour and the airport journey is expected to take around an hour. Ananth Kumar, former Union urban development minister and Bangalore MP, made the case for a metro service to the airport. “We don’t want the HSRL in Bangalore. People will have to come all the way to MG Road to board the HSRL to the airport. Instead, with the metro, people can board from any metro station and get to the airport."